Home › Ocean's Gift series › Rats! “As we threaded our way among the patches of coral, the view from the masthead of the submarine forests through the still pellucid water was very striking. The dark blue of the deep portions of the lagoon contrasted beautifully with the various patches of light colours interspersed. Joe Fisher is hardly the first bloke to go visit the Abrolhos or even Rat Island for a holiday. In the 1930s, Rat Island was considered a holiday resort. 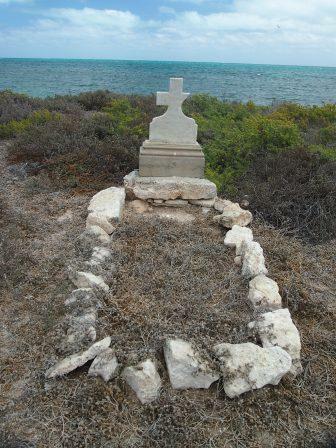 It’s also the island where you can see Giuseppe’s grave. Giuseppe drowned in mysterious circumstances after the Columbia sank in February, 1921. The island was infested with rats, but they have since been eradicated, and the birds have moved back in force. At last count, I think there were at least 100,000 seabirds on Rat Island. From little peeping terns right up to soaring sea-eagles. Rat Island is home to a number of rock lobster fishers like Skipper, Joe and Vanessa from Ocean’s Gift. There are around thirty fishing camps and a research station on Rat Island, too. There are a couple of little beaches, but you’ll be sharing them with a sleepy sea lion or two. It has one of only three airstrips on the 122 islands at the Houtman Abrolhos, but the air strip is at the southern end of the island near the water, so landing always feels like you’re about to go for a swim. ‹ Sirens Versus Sharks – Who’s More Dangerous?